It's the Zombie Apocalypse, and only you can stop it. Find the zombie totem in the Evil Temple in the house of your evil neighbor (you know who I mean), and bury it in the Graveyard before time runs out. Set the Sun and Moon Nulls aside, face up; they will serve as the Foyer and Patio, respectively. 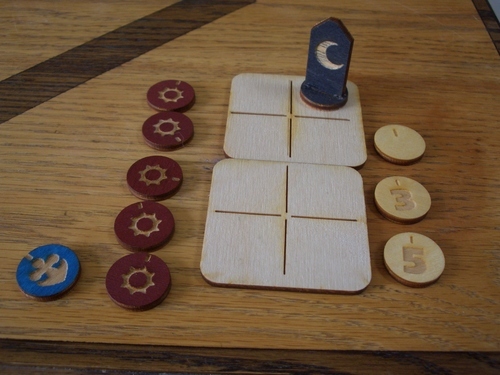 Shuffle the Arms tiles and Ace of Suns together, and set them aside in a face-down stack. Shuffle the Crowns tiles and Ace of Moons together, and set them aside in a second face-down stack. 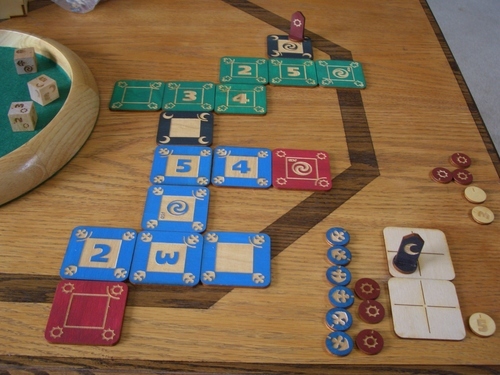 Of the unused tiles, take two and place them face down, one above the other, forming a 2x4 grid. These will serve as a clock. Place the black pawn (representing the minute hand) in the upper right square of the top tile. Place the Foyer tile (Null of Suns) in front of you, face up. Place your pawn on it. Get ready to blow some zombies' fool heads off. On every turn, take the following steps. Move the clock ahead one square clockwise. Each time the clock hand returns to its original position in the upper right (which signifies a new hour), remove the topmost number coin at the right of the clock. If the final coin is removed before you've buried the totem, you lose the game. The numbers on these coins represent the intensity of the zombie outbreak, as the size of their horde increases. Add the topmost number to Moon die rolls during zombie attacks, for up to ten brain-eaters coming after you at once. But you'll be ready if it ever comes to that... won't you? Either place a new tile from the appropriate stack and enter it, or return to a previous room. Use a spare pawn to keep track of what room you're in. If you find yourself in a situation where there's nowhere to go, you may permit zombies to break through a wall of your choice and create a passageway. Roll the Moons die, add it to the zombie intensity meter, and you will be attacked by that many zombies. If you're lucky, zero zombies will smash down your wall for you, and you'll get a free passageway, logic be damned. Roll three dice: Sun, Moon, and Arms. The die with the highest number determines what happens that turn (see table below). Take any special room actions you wish, such as searching a Storage room. Before moving to the next room, you may cower, in the hopes of regaining a health coin. Roll the Suns die. If the number is greater than your current health level, add one coin to your health. Time passes while you cower, so move the clock ahead another notch. Suns You find food. Add a Suns coin to your health meter (maximum 6). Arms You find a weapon or armor. Add an Arms coin to your attack meter (maximum 6). Moons Add the die roll to the current (topmost) zombie intensity number. That many zombies attack you. To find the damage they inflict, subtract your attack power from the number of zombies. To avoid serious damage, you may retreat to an already-visited room, at the cost of one health coin. If you have no health coins left, you lose. Suns/Arms tie Nothing happens. Damn. Suns/Moons tie Same as Moons. Arms/Moons tie Same as Moons. Suns/Arms/Moons tie Same as Moons. With a couple of exceptions, the number on a room tile represents the number of doorways in that room, therefore only that many other rooms may be directly connected to it. Evil Temple: To find the totem, you must spend two complete turns here. Graveyard: To bury the totem, you must first find the totem, and then spend two complete turns here. If you do so, you win. Kitchen and Garden: If you end your turn in one of these rooms, you gain a health point, with no need to roll dice. Storage: You may try to find weapons here to increase your attack power. To search, move the clock forward one space and roll the Arms die. If the number rolled is greater than your current attack power, add one coin to your attack meter. Dining Room: The only way to get outside. To slightly increase the game's difficulty, you may subtract one health point as you smash through the glass patio door. This game is a piecepack port of the cult print-and-play solitaire game Zombie in my Pocket by JeremiahLee?. The original version of these rules appeared in a post on BoardGameGeek. Special thanks to JeremiahLee?, for making ZimP? in the first place, and for allowing me (Dan) to post this variant. Also, if anybody was wondering, I'm using the Color JCD Piecepack, from Blue Panther. I'm not an expert on piecepacks, but I'm very pleased with this set, as well as the fast service at BP.